With high efficiency and reliability in full load, The Synway convergence platform UMCT has been selected to perform highly demanding OBD/IBD application for better expanding Vodafone’s Indian marketplaces since 2005. Synway successfully upgraded Vodafone’s communications system for better efficiency, and helped Vodafone penetrated into competitive India markets faster than ever before. Vodafone comes a long way since making the first ever mobile call in the UK on 1 January 1985. Today, more than 400 million customers around the world choose us to look after their communications needs. In 30 years, a small mobile operator in Newbury has grown into a global business and one of the most valuable brands in the world, and now operate in around 30 countries and partner with networks in over 50 more. True to its origins, Vodafone has always committed to deliver useful and inspiring innovation. In 1991 it enabled the world’s first international mobile roaming call. In 2002, with Vodafone Live!, it sets a new standard for mobile communications with internet access on the move. Firstly, Vodafone (www.vodafone.com) has over 300 enterprise partners across India, including bank, telecom, and power plants. Most of them need highly frequent communication activities, such as announcement, marketing, promotion and so on. How to communicate and associate with each other more efficiently and effective becomes the top issue. A coordinated, robust and future-oriented communications system became more and more important. Secondly, Vodafone needed to make full usage of its existing facility to maximize its value for its business partners. In past 10 years, Vodafone has developed and set up highly efficient TDM and Fiber voice network, with SS7 and IP protocols embedded. It has been in huge investment and still works perfectly and stably. Vodafone needs to find a technical partner with high interoperability and reliability over its existing networks. Thirdly, with a complex traditional communication system and independent branches, some important new communication methods were required, email, SMS, presence alert, call center and IVR in different terminal devices, including intelligent mobile, tablelet, IPAD and so on. So the new communication had to make all these features and functionality available for all of Vodafone’s subscribers. Early in the year 2004, Synway had partnered with the Indian well-known solution partner VoiceGate to build some voice systems for different carriers, including Idea, and it could be tailored to Vodafone’s needs and seamlessly interconnected with Vodafone’s platform. Supporting up to 2000 ports in a single system, the UMCT could fulfill Vodafone’s high capacity requirement. It also platforms feature high flexibility, programmability and high scalability. Incorporating a full suite of protocols, including SIP, SS7, ISDN, CAS, and Telco solution providers can depend on Synway's portfolios to easily deliver gateway functionality and a host of next generation features. Sustainability and interoperability of Synway's products protect initial investment of service providers and application developers. The UMCT possesses rich media processing capabilities, and provide service providers and application developers with matchless cost, high performance ALL-IN-ONE hardware platform easily used for all of CTI applications. Its enhanced built-in resources include conferencing, fax, compression protocols, echo cancellation and call control, which are powered by innovative technologies and expertise accumulated in serving leading service providers, application developers, telecom equipment providers and OEMs worldwide. “Synway's engineers offer us responsive and efficient development, deployment, and design support to help developers rapidly deliver sophisticated revenue-generating applications”, Like VoiceGate’s managing director Mohammad Syed said: “Synway’s new generation UMCT not only cut our information system cost. Unlike its rival products, it has compatible and optimized SS7 protocols compliance, it also provider better service and support, make all Vodafone’s needs possible and available”. In the hypercompetitive environment, The UMCT helped Vodafone continually lower subscription cost for standard service, such as voicemail, and simultaneously offer subscribers more value-added functionalities, such as faxmail, CRBT, etc. Integrate media processing and signaling built on in-house DSP architectures, and support all of multimedia applications, such as IVR, call center, fax and conferencing, and other highly available solution architectures. Rich media processing: conferencing, compression, fax, echo cancellation, call control, etc. Support for enhanced multimedia processing resources, including conferencing, IVR, fax, compression, echo canceller, call control, help developers develop flexible feature-rich applications. 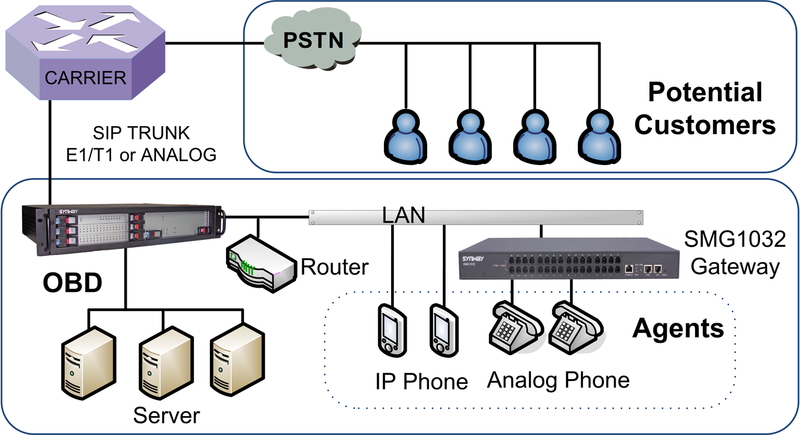 Offer robust signaling technologies, including SS7 (MTP1-3, ISUP, TCAP, TUP), SCCP(MAP), ISDN PRI and CAS for service providers and application developers to develop and deploy high capability, high performance and highly available enhanced services in PSTN and PLMN networks. Unified API architecture minimizes efforts on application development and deployment, and PSTN-based or SIP-based applications can be migrated among all of Synway's hardware platforms. 3. Tele-grade reliability: High cost performance and Telco dual-power redundancy and can efficiently balance the calling overload.